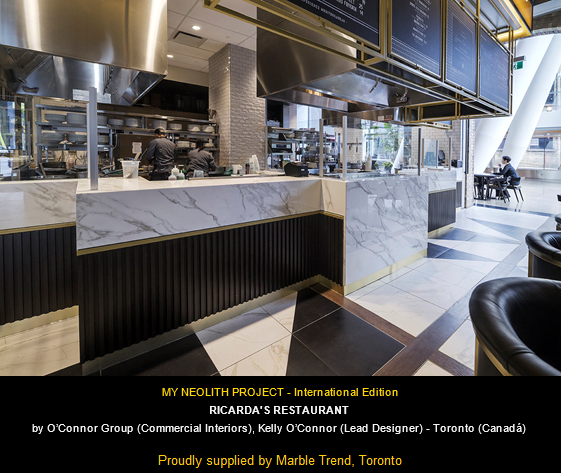 Marble Trend is proud to be the suppliers of Neolith Calacatta at Ricarda’s Restaurant, Toronto, winners of MY NEOLITH PROJECT International Competition, hospitality division. Brief description: Ricarda’s Restaurant is located in Toronto and features large areas such as the restaurant, café and bread shop, wine area and the show-cooking kitchen. The design is inspired by Milan’s coffee shops where long-lasting natural materials such as brass, wood and marble are used. Therefore, the Neolith Calacatta model was used in the Polished finish for all the restaurant countertops and bars used as furniture in addition to the tables where the diners sit. Inspired by the best marble slabs from Carrara, this Neolith model offers a design with a very well-distributed and uniform grey vein all along the slab. The greyish mesh with subtle hints of gold lies on a bright white background. It’s a design that has won a number of prizes such as a Red Dot Product Design Award and the Muuuz International Award 2015, among others. Thus, Neolith Calacatta is the star material in this sophisticated restaurant with a spectacular look and immense contrast.